The Faculty Innovations in Teaching (FIT) Studio is a space for faculty to design, create, discuss and innovate. The studio has recording booths, a live action room, video editing stations, a living room with a large screen TV and much more. Stop by, grab a cup of coffee and learn more. Check out the FIT Studio Reservation page for information on how to reserve the FIT Studio via Outlook. You can reserve various spaces within the FIT Studio including: the Living Room, Teaching Space, Booth 2 and Live Action room. 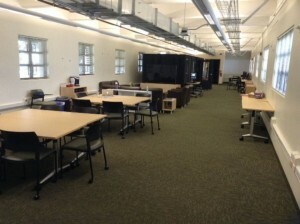 Contact TLInnovations@csuci.edu for a tour or access after hours.